July 29, 2013—Low-income mothers who cannot afford diapers are also more likely to report symptoms of depression and anxiety, Yale University researchers write in the August issue of the journal Pediatrics. Three in 10 poor mothers report they cannot afford an adequate supply of diapers, the study found. Smith said the idea to examine diapers came from over 1,000 mothers interviewed by the by the New Haven Mental health Outreach for MotherS (MOMS) Partnership, an innovative partnership between Yale and seven local and state agencies to support and study the mental health of low-income mothers in New Haven. MOMS offers stress management classes for mothers in New Haven public housing, trains a workforce of community health workers and has created MOMS Hubs, where families can get a broad range of services in their neighborhoods in a supportive atmosphere. Women cannot use food stamps under the federal SNAP (food stamp) program to purchase diapers and usually do not have washing machines to clean cloth diapers. 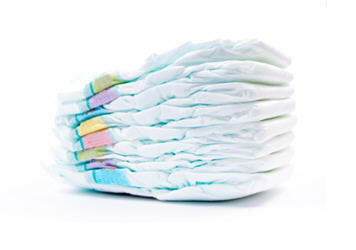 Inadequate diaper supply can affect a mother’s ability to attend work programs and training since most child care providers require that parents provide an adequate supply of disposable diapers. In other research, the MOMS Partnership has found that diaper need was an even stronger predictor of mental health need than food insecurity. The survey of 877 low-income women showed that Hispanics and grandparents caring for children were most likely to report difficulty in affording diapers. Smith recommends that pediatricians ask low-income mothers whether they have access to enough diapers and refer mothers in need to local diaper banks. "Diaper Need and Its Impact on Child Health." Megan V. Smith, Anna Kruse, Alison Weir, and Joanne Goldblum. Pediatrics, published online July 29, 2013, (doi: 10.1542/peds.2013-0597). Press materials provided by Yale University Communications.